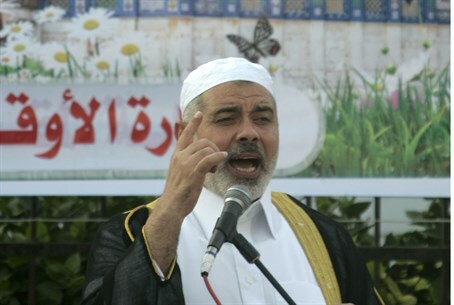 Hamas chief Ismail Haniyeh reiterates that there will be no cease-fire until Israel acquiesces to its demands. In a recorded speech broadcast on Hamas television, Hamas chief Ismail Haniyeh on Monday announced that Hamas would not agree to a cease-fire unless Israel agreed to its terms. Haniyeh listed ten demands that Israel would have to agree to if it was interested in a cease-fire. The conditions include an “immediate end to Israeli aggression against the Palestinian people in Gaza on land, in the air, and by sea;” an end to targeted elimination of Hamas terrorists; a cessation of the policy of destroying terrorists' houses; a halt to the flyovers by the Israel Air Force over Gaza; the reopening of land crossings, and the rehabilitation of the Gaza seaport; the free flow of goods into Gaza; a guaranteed supply of fuel and building materials; an end to “collective punishment” of Gazans; and continued supply of electricity. Both US Secretary of State John Kerry and UN Secretary-General Ban ki-Moon are on their way to the region and are likely to present frameworks for a cease-fire. Egypt on Monday said that it was willing to adjust its cease-fire proposal in order to get Hamas to agree to it. On Monday, Prime Minister Binyamin Netanyahu said that the operation in Gaza was likely to expand further.